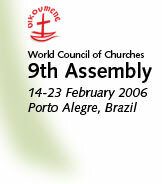 The Assembly recognized the 150-plus stewards serving in Porto Alegre during a plenary session Wednesday. Delegates and others paused Wednesday afternoon to say thank you to the 150-plus young adult stewards who have assisted the operations of the Assembly over the past two weeks. The stewards received a long and enthusiastic round of applause as they gathered on the plenary hall stage. "I cannot imagine any more authentic way to express our Christian vocation than 'servant'", said Catholicos Aram I, WCC moderator, expressing his "deep gratitude" to the group assembled around him. "And you are here from different churches, different parts of the world not to serve us, but to serve this Assembly." 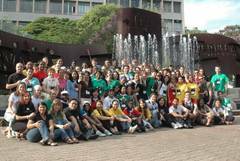 Young adults from every region of the world apply for the stewards programme. Those who are selected gain an ecumenical experience while helping with many of the "behind-the-scenes" tasks necessary for WCC events to occur.